Claire Ridley discovers the charm that this lesser known island in the Caribbean has to offer for adventure-loving newlyweds. Disembarking the small LIAT aircraft at Douglas-Charles airport on the northeast coast of Dominica, the warmth of the early evening heat and view of the lush green surroundings on this volcanic island, known as the nature island, immediately greeted me. I was already in love with this tropical paradise that sits on the eastern side of the Caribbean, just a few miles from Martinique to the south and Guadeloupe to the north. During the two-hour road trip across the island to my hotel, the vibrant colours of the painted houses and shops provided a cheery welcome while the local towns offered a laid-back vibe. I was ready for some sun, black sand, sea and adventure. I wanted to explore every part of this country where honeymooners searching for an authentic Caribbean experience with a slice of adventure can now enjoy the new Adventuremoon packages on offer. My first day in paradise started with a visit to the glistening Champagne Reef Dive & Snorkel which attracts an abundance of sea life and has underwater springs where you can watch bubbles rise from the seabed that's warm to the touch – hence where it gets its name (www.champagnereef.com). My knowledgeable guide, Bert, took me to a snorkelling hotspot where I saw many types of aquatic life including French Angelfish, Pufferfish, and a Queen Parrotfish. Wearing a life jacket (which is highly recommended) I was able to gently float and relax, taking it all in. 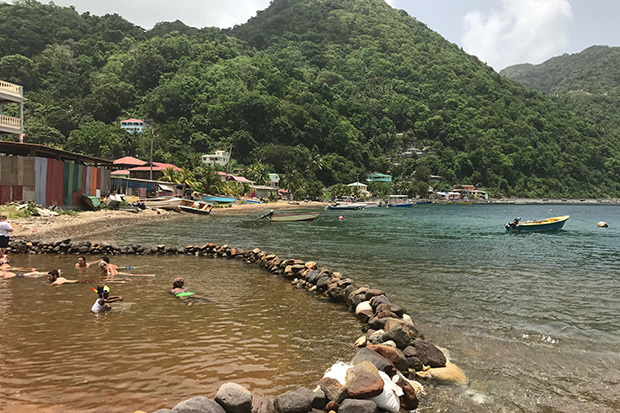 Next was a visit to Bubble Beach in the village of Soufriere to relax in the natural hot sulphur spas, said to do wonders for the skin. This was followed by a trip to nearby Scott's Head Pinnacle where the panoramic view of the Caribbean Sea meeting the Atlantic Ocean is an Instagrammable moment! 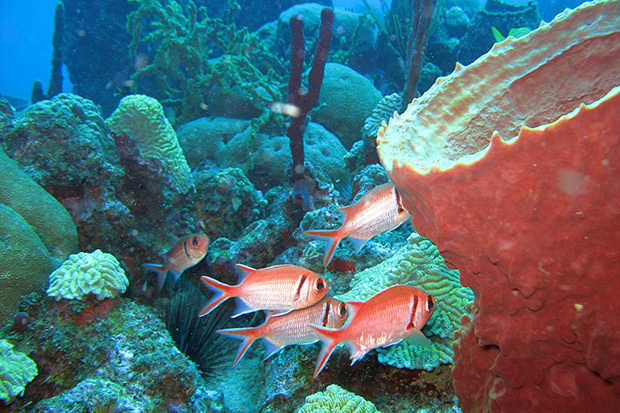 Honeymooners looking to spot sperm whales (who reside all year round in Dominica) should spend an incredible afternoon at sea whale watching with Dive Dominica (divedominica.com). Every Sunday at 2pm, the boat heads out and regularly spots these giants of the ocean. Day two saw a visit to Titou Gorge and the entrance to the Boiling Lake. 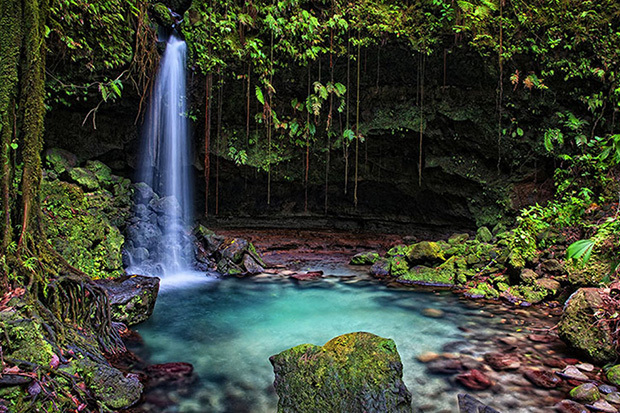 Famous for hikers seeking a six-hour walk through the rainforest, the Boiling Lake is the world's largest and is found at the end of Dominica's most demanding trail. I opted to relax in the freshwater pool surrounding Titou Gorge instead, where an exhilarating jump into the deep waters below and short swim through the gorge reveal a hidden waterfall. Swimmers need to be aware that the currents are strong so wearing a life jacket and swimming with a guide is essential. Those in search of this natural wonder without getting wet should head to Trafalgar Falls, a spectacular twin waterfall where the viewing platform is accessed by a short walk. Lovers wanting to find that romantic, tranquil spot (à la Tom Cruise in Cocktail) should visit Emerald Pool located in the UNESCO World Heritage Site of Morne Trois Piton National Park – a waterfall grotto where the shimmering fresh water appears green in the filtered sunlight and is warm and inviting to swim in. Being a spa lover, I was eager to visit the natural spa village of Wotten Waven and I wasn't disappointed. An afternoon spent relaxing in the sulphur baths at Tia's Bamboo Cottages (said to have medicinal qualities) was needed after the amazing sights I'd just seen (www.tiasbamboocottages.com). This island has so much to offer and the highlight of the trip for me was yet to come. Being a Johnny Depp and Orlando Bloom fan (well, who isn't! 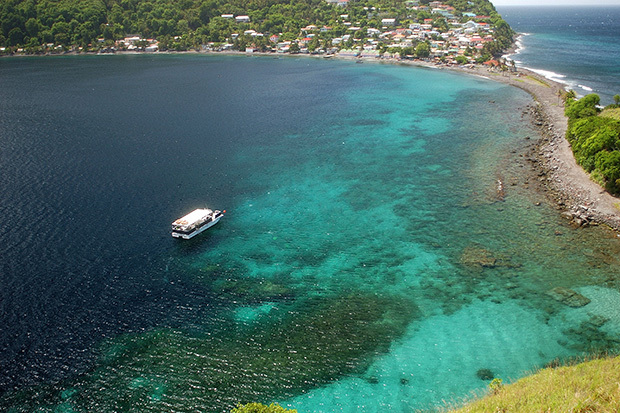 ), I was excited to take a trip down the scenic, Mangrove tree-lined Indian River, an eco-site and the widest river in Dominica flowing to the Caribbean Sea where they filmed Pirates of the Caribbean: Dead Man's Chest. I met my charismatic guide with Cobra Tours (www.cobratours.dm) and climbed aboard the wooden, hand-oared boat to set off up the river. A birdwatcher's paradise, there are so many types everywhere you look, not to mention endless varieties of flora and fauna. You really do feel like you are in the middle of nowhere, until you reach Bush Bar & Botanical Gardens where you can stop for a peanut, coconut, and passion fruit rum punch! 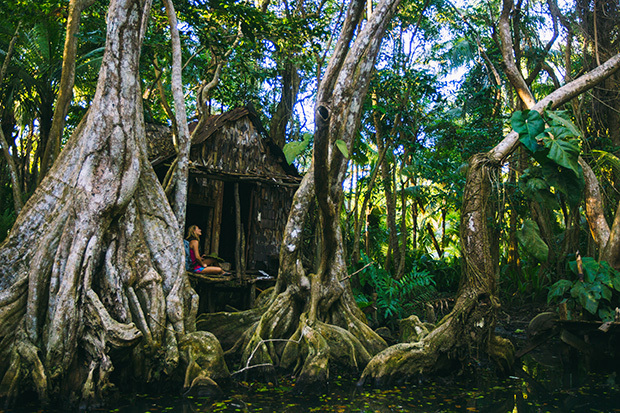 Finally, we reached the tree house of Tia Dalma from the film and stopped to capture it all on camera. 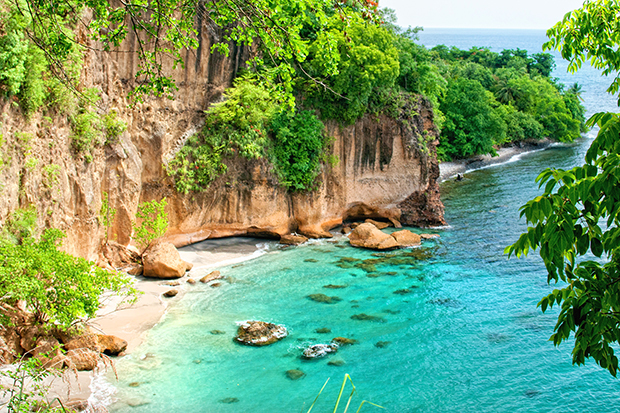 There's much to explore on this paradise isle. 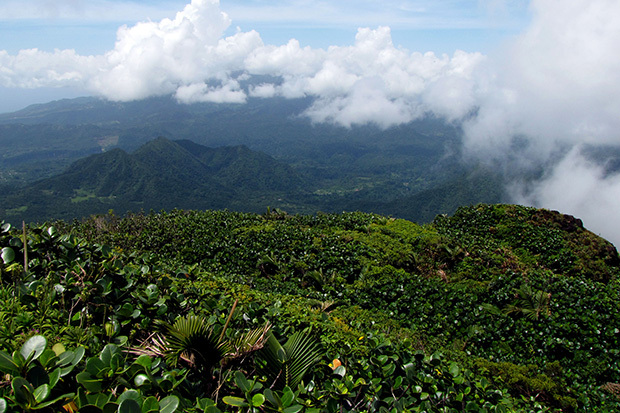 The capital city of Roseau and the island's second largest town Portsmouth are not to be missed, neither is a visit to the Kalinago Barana Aute (www.kalinagobaranaaute.com) for a cultural tour to experience the last remaining Kalinago people of the Caribbean. It really will be the trip of a lifetime and a honeymoon that dreams are made of. 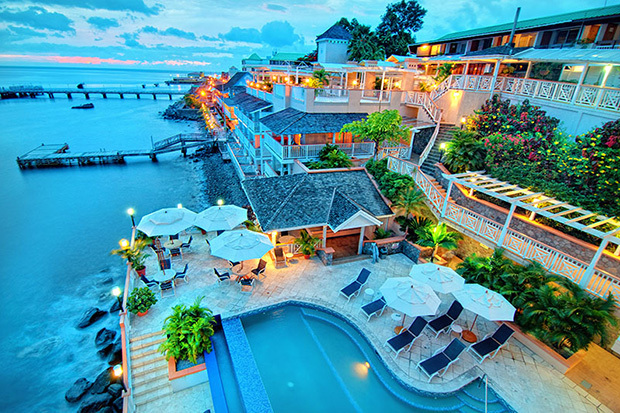 Fort Young Hotel (www.fortyounghotel.com) in Roseau is one of Dominica's best-known luxury hotels. Located opposite the palatial President's residence, it offers large rooms with sea-facing balconies. The Palisades Restaurant serves traditional specialties including Kingfish, plantains and black pudding for Sunday breakfast! Bala's Bar serves the best rum punch and the nightly entertainment is traditional West Indies music and dancing. Another luxury resort is Rosalie Bay (www.rosaliebay.com), an eco-boutique resort with a focus on wellness where honeymoon accommodation comes in the form of nine cottages housing 28 luxurious rooms and suites providing a romantic hideaway. 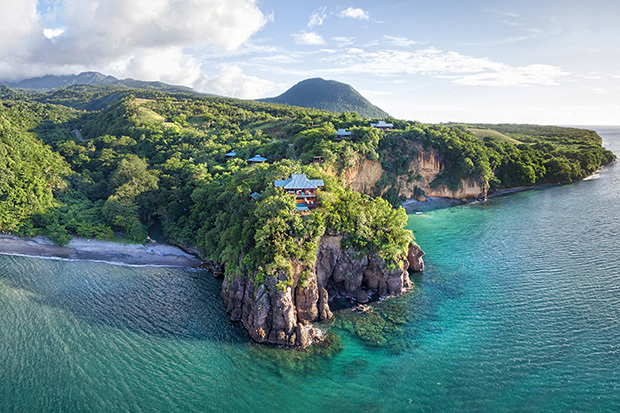 The hotel's best feature is the opportunity to watch endangered sea turtles nest on the black sand beach as well as their spa, a sanctuary nestled on the Rosalie River. Relaxing and rejuvenating treatments using natural products including detoxifying volcanic mud, papaya and handmade coconut oil can be enjoyed in this oasis of calm. 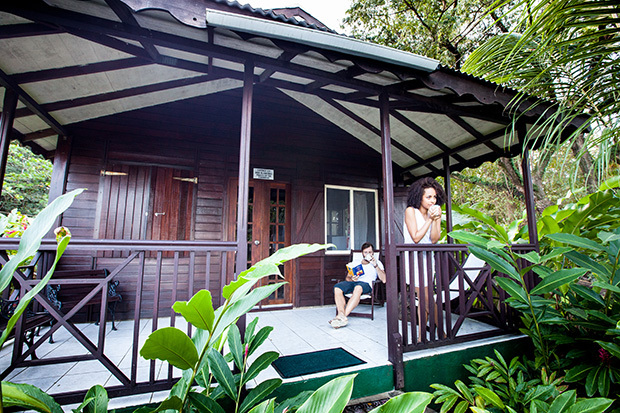 For rooms on the water's edge, Dominica's longest sandy beach to be precise, Picard Beach Cottages are private wellness eco cottages set on an old coconut plantation, home to many different flowers, fresh fruit and coconut trees (www.picardbeachcottages.dm). 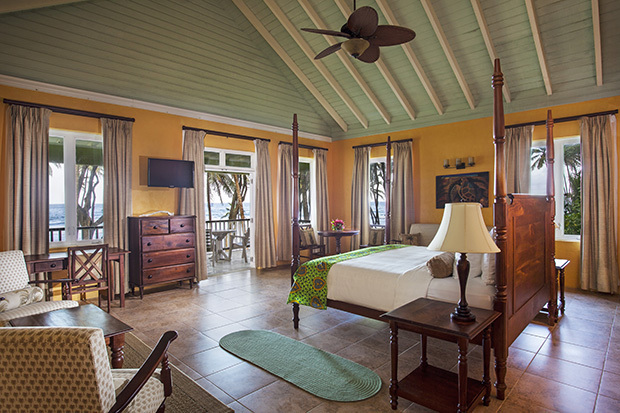 The cottages are named after the crew of Pirates of the Caribbean: Dead Man's Chest after they all stayed there and house a separate bedroom, bathroom, living area with kitchen and a stunning sea-facing deck. Kick back and relax under the swaying palms or join in the social scene at the lively restaurant and bar. You could also spend a night at Secret Bay, an award-winning hotel with eight sustainable luxury bungalows and villas (www.secretbay.dm), at Papillote Wilderness Retreat offering the typical exotic honeymoon getaway with lodging, dining and a spa set in magical natural surroundings (www.papillote.dm) or at the elegant Beau Rive, a boutique hotel offering a home from home with its library, bar, lounge area and rooms with verandas boasting far-flung ocean views (www.beaurive.com).